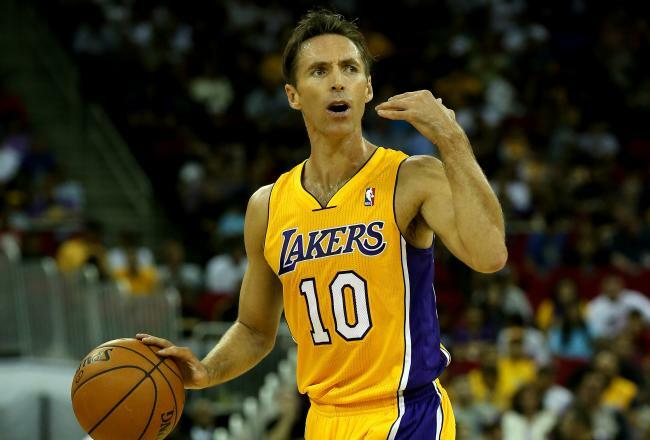 Steve Nash probably never thought he would be playing with the rival Los Angeles Lakers. After spending his whole career with the Dallas Mavericks and Phoenix Suns, I’m sure Nash has held a certain disdain for the franchise, especially with all of the playoff battles between his Suns and the Kobe Bryant led Lakers in the mid 2000’s and then again in 2010. This off season, Nash was a free agent looking for a new home. Everyone knew the Lakers had their eye on the 38 year old point guard, but nobody ever thought Nash would even consider Los Angeles to be his new home; most of the attention was going toward the New York Knicks and their run and gun style offense, and up north to his home country with the Toronto Raptors. On top of those things, both of those teams had something that the Lakers did not: Money to spend; Nash was offered 3 years and 36 million from both teams, however Nash had decided that being close to his children was the best option for him (not to mention an incredible opportunity to win an NBA championship) and told the Suns Front Office to make a deal with the Lakers. Seeing as how the season will start tomorrow, I think it’s time to take an extensive look at the Lakers’ new point guard. Nash might have the highest offensive basketball I.Q. in the NBA. His court vision is rivaled only by Rajon Rondo of the Boston Celtics and his passing ability is tops in the League. His 6’3’’ frame helps him see over the top of his defender to identify passing lanes and read the defense. While his listed 185 pound frame is a liability on the defensive end, especially when he’s forced to switch onto shooting guards or other taller, stronger opponents, on the offensive end, it’s a blessing; His end to end speed is middle of the pack for point guards, but due to his weight, he is able to keep his quickness in short distances, which outstanding and helps him utilize screens to their full potential. Nash is the master of the pick and roll offense; nobody has been this good at running it since John Stockton in Utah. Nash is a very gifted offensive player in nearly every aspect. One of the most efficient perimeter players in NBA history, Nash’s offensive game is a post-game away from being the most complete offense ever witnessed. Teams cannot run any kind of defense aimed at stopping Nash because even if you keep him off of the board, he knows how to beat you by passing the ball. Jordan rules or double-teams would be especially ineffective against him because of his court vision and surgeon-like precision when passing the ball. Steve Nash is the most important offensive player on the court on any given night because he brings so much to the table. He’s not a typical scorer like teammate Kobe Bryant, and he’s not strictly a point guard with no range on his jumper like Rondo. Nash is something in between those two extremes; he can score with the best of them from anywhere past the half court line and do it with efficiency from any range, all while keeping his teammates involved and not turning them into spectators (a problem Bryant had with the mid 2000’s Lakers). Nash has slowly added more and more to his offensive game. He’s one of the best shooters in the game: Last season, Nash shot 53.2% from the floor, and his lowest percentage from any range was 39% from 3 point range. He shot over 53.7% from every range inside of the 3 point line except for 10-15 feet, where he still shot an efficient 49.5%. His 74% shooting at the rim was one of the highest in the league, even higher than teammate (and center) Dwight Howard. He’s one of five players to be a part of the 50/40/90 club (50% from the field/40% from 3 point range/90% from the charity stripe), which is some very elite company as this club includes Reggie Miller, Larry Bird, Mark Price and Dirk Nowitzki, and has had the most seasons being a part of it with 4. The main reason Nash is never in the conversation for best player in the NBA is his defense; Nash is one of the worst players in this aspect and is one of the only star players (and MVP’s) ever to score a negative Defensive Win Share over a full season; Nash has never had a 2 or higher DWS except for his MVP winning season in 2006. This is offset by his spectacular offense, of course; however he has cost his teams more than a few victories with bad defense. The question now becomes: how well can Nash fit into the Princeton Offense run by coach Mike Brown and assistant Eddie Jordan? Steve Nash is an excellent shooter, so even if he’s not used to running the Princeton Offense, he still provides value as a scorer. He will start nearly every possession with the ball in his hands and will quarterback the Lakers’ offense. He dictates the tempo of the offense, how the possession evolves and who gets the ball against certain opponents or during certain situations; Nash will have freedom being the triggerman of the offense. If Nash wants to run a pick and roll to start a Lakers’ set, he can, if he wants to run a play where Bryant will get the ball early and be the primary option, he can do that too. If it’s time to get Pau Gasol or Howard a touch in the post, Nash can make that happen simply by organizing his teammates and dictating how the play unfolds. Nash has that power for most of his career, and he’s definitely earned it. Coach Brown wants his team playing at a faster tempo than they showed last season. In Brown’s introductory press conference a year ago, one of his key offensive principles was to push the ball up the floor. The only problem was that the Lakers didn’t really have the personnel to do that (I’m looking at you, Andrew Bynum). This season, some of the slower players are gone and that will allow Nash to increase the speed at which the Lakers play. He’ll get more early offense opportunities and can create more plays in transition. The Lakers have the yang to Nash’s yin in Dwight Howard. Simply put, Nash is one of the very best pick and roll guards and the Lakers have themselves the most devastating pick and roll finisher in Howard. Nash, according to Mike Brown, will have the opportunity to run pick and rolls to start every possession if that’s what he chooses. Whenever Howard and Nash share the floor, they’ll be able to go away from the Princeton and instead unleash the play that’s been the bread and butter for both of them for years. The ability to fall back on this should a play break down really can’t be overvalued as it will keep the Lakers offense efficient, and will get a good opportunity to score virtually every possession, and it will keep Kobe Bryant from unleashing an extremely contested shot with the shot clock down to only a few seconds. The Lakers offense will be much improved with the addition of Nash. Initial concerns were over defense, but now that has been handled by getting Dwight Howard to provide weak-side help on the defensive end. Nash could very well be the key to the Lakers championship hopes next season.